The old MAC is not longer available. So I can't tell you details. The Mac support were added by a member of GBAtemp in 2010?, but I didn't remember the guy. @Wiimm I almost got it to compile successfully using an old PowerPC-based Mac I have like you were using, but I got an error where it's trying to load a .dylib fie for ncurses. I installed ncurses and libpng with MacPorts, do you remember if you used that or manually installed the packages? I remember it very exact: I never installed anything at the Mac -- I was only user! I'll ask the owner next time I speak with him. Soeben habe ich Wiimms SZS Tools v2.01b freigegeben (bug fix). The owner lost the info about the kind of installation. 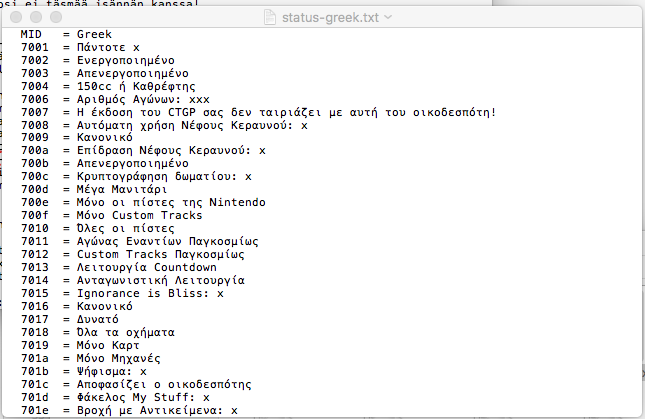 Hello @Wiimm , as you probably know I have taken charge of CTGP's Translation, and I've moved all of the text to a spreadsheet. Ive recently made a script that can convert a .tsv to a properly formatted .txt file for your WBMGT tool. However, I was wondering about one thing, would it be possible to allow a single piece of text to have multiple MIDs? For example Nintendo sometimes has the same text in multiple locations. And I dont want to have 3 separate rows that all have the same text, as that would take up a lot of space. I was wondering if it would be possible to allow for multiple MIDs for a single string, and then your tools could just put that text in all 3 locations at once or something. and then your tools could just put that text in all 3 locations at once or something. or, extending that feature: it could add multiple entries to the message ID table pointing to the same offset into the string pool so the BMG would be smaller as well. Multi-ID for a single text is only available for track and arena names. But there is no problem to use a tool (e.g. awk or php) as preprocessor and pipe the results to wbmgt. No. The special track name support is a hard coded exception. A preprocessor that duplicates the entries is much easier to develop. And you already need such tool to convert the tables data into a "MID = TEXT" file. The only concern that I have is that the revision number and the date are incorrect in the filename and on the header embedded into the app. Is there any way I can change this to be correct? If you help me with this, I hope you can put this on the download page, then upload the source code of v2.01 so we can compile that as well.